Worley-Luginbuel Funeral Home, Jay, Oklahoma, 918-253-3222. 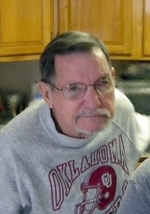 Earl J. Yocham, 80 year old resident of Jay, Oklahoma, passed away on September 11, 2018 at St. Francis Hospital in Tulsa, Oklahoma. Earl was born on April 2, 1938 in Sapulpa, Oklahoma. He was the son of Loyron (Lowell) Franklin Yocham and Tillie Mae (Acree) Yocham. Earl was united in marriage to LaVerne Kirkwood on March 6, 1960 in California. Earl and Laverne owned and operated a Dairy Farm for many years, and then operated a second hand store in Jay. Earl enjoyed spending time and taking care of his yard, working word search puzzles, and spending time with his family. Earl will be dearly missed by his wife LaVerne Yocham of the home, two sons; Barry Yocham and wife Sandi of Siloam Springs, Arkansas, Steven Yocham and wife Shelley of Jay, Oklahoma, daughter in-law Shela Yocham, his brother David Yocham of Mounds, Oklahoma, his sisters Pauline Hunkler of Sapulpa, Oklahoma, Lorene Bitsko of Tulsa, Oklahoma, and Kathryn Brand of Pryor, Oklahoma. Earl adored his grandchildren; Marty On-the-hill, Matt Yocham, Mindy Wall, Denisha Woodcock, Kelby Yocham, Kyle Yocham, Kadi Ryan, Hailey Beamer, Kanen Craig and Kelsy Barrett. He was blessed with thirteen great grandchildren. Earl was preceded in death by his parents, a son Duane Yocham, a daughter Teresa Yocham, a brother Troy Yocham, and four sisters; Thelma Thomas, Velma Dawson, Nellie Jane Yocham, and Judy Dempster. Services are scheduled for 2:00 pm, Friday, September 14, 2018 at Jay Worley-Luginbuel Funeral Home Chapel with Pastor Junior Jones officiating. Earl will be laid to rest in the Duffield Cemetery. Online condolences can be made by viewing Earl’s Book of Memories at www.honoringmemories.com. This obituary is protected by copyright by The Luginbuel Family. Proudly Serving the Communities of Vinita, Bartlesville, Grove, Jay, Langley, and Nowata. The Luginbuel Family is located in the state of Oklahoma, United States.